I interviewed Scott Dickson by email last week for an artist profile for the Kokanee Crankworx Event Guide. Dickson’s art brings a vibrant and vivid energy to the 2011 event poster – it’s a refreshing alternative to the photo-heavy approach that event posters often resort to. 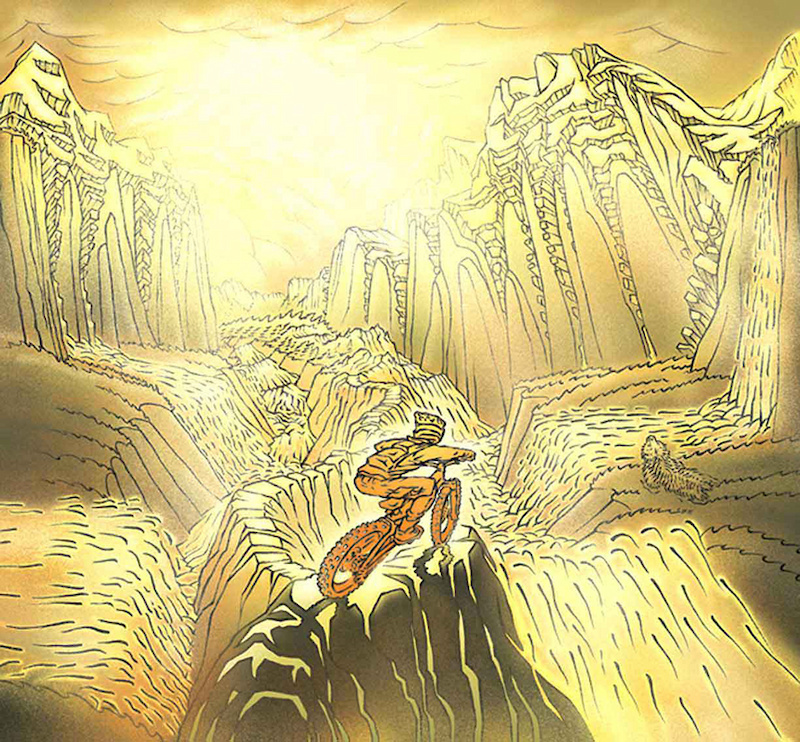 Sometimes the freeride world with its gladiator vibe and bro-down energy intimidates me a little. (I just don’t get those 10 part handshakes.) But Dickson, for all his core-credentials (art director at Freeride Entertainment, illustrator for Troy Lee Designs and the Motocross National, cover artist for the latest Kootenay Mountain Culture magazine) is so humble and down-to-earth, it’s impossible not to feel a real satisfaction that the young artist behind the Whistler Mountain Bike Park’s first promo poster got a chance to put his mark on the place again over 10 years later. Our ‘conversation’ rambled all over the place and it seemed a shame to leave these insights from Dickson on the cutting-room floor. So here are a few of his comments on the role and opportunities for action sports artists. Do you think there’s been an overall growth in opportunity for artists to work in the action sports and outdoor industries? SD: Yes, totally. With the technology that the manufacturers have, they can reproduce images onto the products themselves, like printing complicated pictures on fabrics or oil paintings on skis and snowboards. Then they can use the same image for print, web and moving pictures. That is a lot of value. When you add in the infinite number of styles available in the world from all of the artists out there or even the unique opportunity the brand has to create custom one-of-a-kind pieces for their specific purpose, it can be a powerful mix for conveying an idea. Does working with an illustrator who lives and breathes the culture guarantee a more authentic look and feel for a brand? Or will it always be associated with the “freak”y passionate ones? Your style smacks a little of the fringe/counterculture to me – ski-touring, rootsy kind of stuff. But Crankworx is a different energy altogether. Has that been a shift for you? SD: For being close to the core, I think art is a bit more raw, and because it is hand-made it can feel more personal and unpolished, which makes you think of someone who is more busy at doing their thing than polishing up their drawing technique. But they are going to express themselves ready or not. For these kind of pieces it is the message that matters more than the medium. Also, working with people who have a passion and understanding of what they are communicating is a big advantage as long as they can translate it to a casual observer. 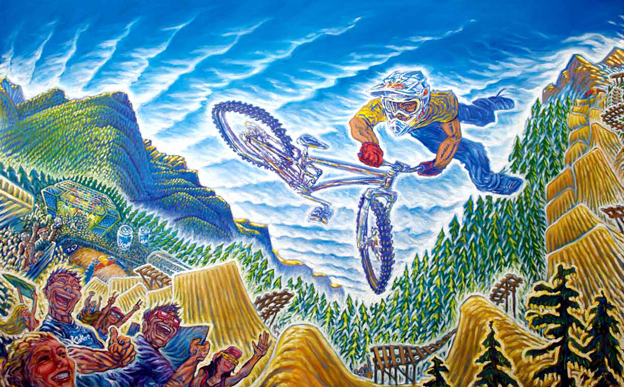 This painting for Kokanee Crankworx was a big deal for me due to Whistler’s rich history so I tried to make sure to hit the points I needed to and refine my style as much as I could along the way. Next Post Dirt. Rock. Wheels. Flow.